Rainscaping is any combination of plantings, water features, catch basins, permeable pavement, and other activities that manage stormwater as close as possible to where it falls, rather than moving it someplace else. Below ground level, improved soils store and filter stormwater, allowing the surrounding area to slowly absorb it over time. Above ground level, native plants, basins, and water features create public green spaces that also help store water. Used effectively, rainscaping can reclaim stormwater naturally, reduce sewer overflows, and minimize basement backups. The Rainscaping program of MSD Project Clear has announced the fifth round of a rainscaping cost-sharing opportunity. MSD seeks to continue to build partnerships with municipalities, local government agencies, schools, community development organizations, and private developers through the Rainscaping Large Scale Grants Program. Visit the Project Clear Website for the rules and requirements for partnering with MSD Project Clear, an application form, and a map showing the program area for the Rainscaping projects. Please note that the application deadline for the 2016 round of Rainscaping Large Scale Grants is 5:00pm on October 31, 2016. High Performance Urban Ecosystems, an in-depth seminar on September 9. Check out Heather’s article, originally published in Healthy Planet Magazine, for a preview! Imagine a home or urban landscape that can ease the impacts of drought, reduce flooding, improve the water quality of creeks, rivers and lakes, cut energy costs, clean air, and capture greenhouse gases all while improving our health and happiness. Sounds awesome, right? These benefits, known as ecosystem services, are the goods and services that we all depend upon which nature provides for free. As you might imagine, ecosystem services have a tremendous monetary value, estimated at $46 trillion per year. All landscapes whether urban, suburban, or rural have the potential to provide ecosystem services that extend both locally and globally. Unfortunately, in our quest to create more sustainable environments, the potential of residential and small urban landscapes are often overlooked. Residential landscapes make up almost half of the total green space in most cities. A single homeowner or coalition of neighbors can have significant impacts. When considering ecosystem services, it is important to think about the connections between natural systems – soils, water, vegetation, climate, wildlife – and to look for landscape strategies that have multiple and long-term benefits. One strategy that is often overlooked is soil maintenance and stewardship. Soils and vegetation work together to provide a wide suite of ecosystem services. Plant roots provide food for soil microorganisms, which in return make nutrients available for plants and improve soil structure. Good soil structure is necessary for the movement of air and water in the soil, both of which are needed for healthy vegetation and sustainable water management. Organic matter is key to developing and maintaining good soil structure. Plants are continually adding organic matter to the soil via roots, leaves, and branches. Soil microorganisms are also a source. Landscape practices that remove plant tissues such as bagging grass or leaves, rob the soil of a valuable resource. Selecting maintenance practices that allow organic matter to stay in place and decompose such as grasscycling or leafing shredding can easily amend this. Other practices include adding compost and mulch to the landscape on a regular basis. Landscapes that maintain healthy levels of soil organic matter can rack up multiple benefits including improved plant growth and resistance to disease, a more diverse and robust community of beneficial soil microorganisms, minimal fertilizer and pesticide requirements, an increase in the soil’s ability to hold more water thereby reducing irrigation needs, and protection from soil compaction which increases erosion. As with other ecosystem service benefits, the positive payback is not limited to the homeowner, but the entire region can receive a gain. Landscape for Life developed by the U.S. Botanic Garden. Teacher and student resources cover support sustainable soils, vegetation, water, landscape materials, and human health practices. The St. Louis Audubon Society program, Bring Conservation Home, provides on-site assistance to small, private landowners in the greater St. Louis area for the restoration of native plant and animal habitat. 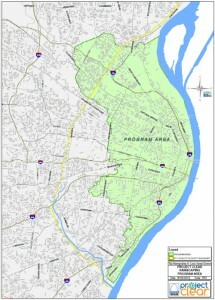 BiodiverseCity St. Louis, an initiative to promote, protect, and plan for biodiversity. A lecture on Upcycling Our Urban Ecosystems presented by Heather Venhaus will take place on September 8, 2015 from 5:30-7:30pm.